and i am having my french end of year on wednesday! i will probably flunk it. can see that chew hongkiat. heehee. i wanna see how different he look. haha. looking forward to dat day. i am now at the computer lab wif my dear si jia. i shall satrt wif FRIDAY. it was a really sad day lah. dun want to talk abt it already. dat day go home my mum ask me why me eyes so red and puffy. i was lyk "oh shucks. its obvious dat i have been crying." then i said "aiya nth lah got sth go into my eyes." i woke up early early. go singapore expo for the travel fair. actually we were supposed to go spain and portugal OR eastern europe. Nicholas go NS. wah without him surely not fun. then dat YEO HIOK YEONG. he go and say "aiya we go nxt yr lah. so many ppl cant go..."
then we ended up going to KOREA AND JEJU ISLAND. should be super boring lah. daddy says dat we can go for a cruise holiday. and we are going phuket too! i will have a nice time shopping. and i mugged till 2 plus today. mugging mugging and more mugging. so sian lah. sch is so not fun. everyday listen to the teachers talk crap. i feel lyk sleeping sia. juz now during dnt, catherine wrote a rhyme. haha i shall type it one of these days. and i really hope dat sijia will have a party. then i can see all her frens! and i have a GOAL FOR MYSELF! NO PLAYING OF COMPUTER UNTIL THE EXAMS ARE OVER! I SHALL TRY MY VERY BEST! today was so damn suay. starting wif the HISTORY TEST. the things dat i studied nv come out. the things dat i never studied come out. erm and i think sure fail one lah. some more today got situational test. dun feel lyk talking abt it. all the PCs and PSLs act until so scary. their attire was damn bad. then we had to say say say. aiyah i cant get through one lah. k i gtg and do my work alr. people, 7 more days to EYE! today i got back my french results. but i was quite supprised lah. i got 60 over 80.
but hor that naishad so smart. get 78 over 80! and after french today, i think i am really super super short. ok i must grow taller! and hor this few days i very unhappy! then i feel so "un-jolene"
i cant fold my skirt. i cant wear ankle socks. i dun want to be wat PPL anymore! today is SUPER FUN! it was the 3RD NATIONAL JUNIOR SCRABBLE COMPETITION! although i wasted a lot of time, but i guess it was worth lah. ok so i shall blog abt today. early in the morning, i woke up. u noe how early? 6.10.
then i went down to meet joey at 6.55.
then we went daqiao together. i was quite excited lah cz dunno wat to expect. i only see lane runners doing their job but never be lane runner before. then when i reached i saw mr austin tan and mr tan kiat ann. lol. i say alr also nobody noe. then after that i saw wei ren and roysmond. no wrong. is they see me first. coz it was very dark so i cant see. then i ask "hey who are u arh?" ok nxt we went up to the hall. then slowly everyone warmed up liao. then mrs tan started distributing milk and sweets. i didnt take the milk coz I HATE MILK! the sweets i havent eat yet so i dunno. k so the first game starts. haha i was in charge of tables 28, 29 and 30.
at first arh, i cant rmb a single thing. but luckily the players were quite nice. i particularly lyk ST HILDA'S TEAM 6! they consist of: Grace, John, Jiemin, Darren and Marcus. haha they all primary 6 so cute lah. then after the game i gave them mentos! so 2nd game 3rd game and 4th game i decided to follow them. they all super smart lah. i dun rmb getting 600 plus in my whole life! marcus and john so super pro. and they told me they dsa go raffles, hwachong and all those very good schools! in the end they got 2nd! haha i am so happy for them! coz i really admire them. think if i play wif them sure kena thrash. haha ok afterall i am not a very good scrabble player. and today i got BULLIED. by ROYSMOND SIM AND KOH WEI REN. ok cannot put so big later they come and kill me. ok lah they nv really bully me. but keep on teasing me. by the way, i have hot news. 1. Jie Min has a secret admirer. i cannot say who. but the brother is in raffles. 2. Roysmond is very popular. 4. Jolene is very nice. Hahaha. the last one lyk very ego liddat. erm today is really very fun! oh if i suddenly rmb sth, i will blog abt it. this is my 100th post. haha so fast. I AM SICK BTW. SO SAD GOT FEVER AND FLU. AND SCH IS GOING TO REOPEN SOON. THEN WHEN SCH REOPEN GOT EXAMS AND TESTS. ITS DRIVING ME CRAZY LAH. why everybody study so hard arh? i dun want to lose out leh. so as a result, poor jolene has to mug and mug. ok i shall go and mug now. but before dat, i am gonna put up the tribute that i wrote to the straits times abt mr peh. lol. and u guys go and compare see how many parts they cut! Common Test 1 came. I failed. I was really depressed. Looking at my pathetic score, I cried. It was the first time I ever failed my exam! However, Mr Peh’s encouragement kept me moving. I knew very well that I had to do it, no matter what. After all, this year is PSLE (Primary School Leaving Examinations)! In the twinkling of an eye, Mid Year Examinations came. I scored a B. Though it was still mediocre, I was over the moon because I finally saw the results of my hard work! At least I have given my best shot! Then, it was 4 more months to PSLE. Tension is mounting rapidly. Revision papers and worksheets were given to us all in a stack as high as a mountain. Like many other teachers, Mr Peh sacrificed his precious holiday going through revision papers with us. Not only that, he taught us moral values too. He enlightened us by showing us some newspaper articles about the success of others. There was something he said which left a deep impression in my mind. “Those who hope to do well are hopeless. To materialize your dreams, you have to put in effort.” Not only that, he taught us study skills too! He taught us how to make notes and study for our examinations which boosted our confidence for the Prelims which are round the corner. Just want to let you know that it has been very great teaching you. The limit of any man’s growth and progress is the limit which he places on himself through wisdom, perseverance, determination, diligence, self-discipline and strong fighting spirit. After reading this card, I was very touched. No words could express my heartfelt gratitude to Mr Peh. He is really an extraordinary teacher. Although he may be fierce and strict at times, I know that he always have our interests in his heart. He is approachable, jovial and friendly. What’s most important is that, there seems to be no barrier between the pupils and him! We could always talk to him if we are in need. One month before the PSLE, there was intensive revision. Mr Peh motivated us a great deal. “The fittest survive. In this national exam, it’s either you survive or you perish. It’s all up to you. If you are on your death bed and you still do not want to wake up, there’s nothing I can do.” He set us a goal every weekend. For example: “This week, everyone will have to finish revising the P3 and P4 Science topics and make notes.” He believes that all of us will have the self-discipline to do what we are required to. It is the mutual trust in us that Mr Peh can work so well with us to produce stars. After all the hard work put in, I finally got my desired result. I scored A in the PSLE for Science! To me, it’s a great achievement. Everyone in my class, P6 Ruby got A* or A. From majority failures to this, we have indeed came a long way. Mr Peh have successfully shaped us into precious rubies. Lastly, I would like to take this opportunity to thank Mr Peh YM of Da Qiao Primary School. Thanks for all your guidance! I would always remember the passion you have towards teaching! Thanks once again! You will always be the most fabulous teacher in my heart! the end. i noe i super mushy lah. *and melissa, i am not MOJOJOJO! heehee. Today i am very upset with myself. i SLACKED in the afternoon! now then come and chiong my work. all because of today's training! WE HAD THE BOUNDING TEST! now my limbs are lyk jelly. coz bounding requires the coordination of legs and hands. tiffany and melissa was damn pro lah. haha. btw, my bounding only 17.8 metres. must go and use deep heating cream already. i am looking forward to saturday btw. well, must go study alr. coz i dun want to lose out. esp when that NATALIE WONG IS GIVING ME SO MUCH PRESSURE. haha. she study so hard for wat? ok everyone must think that i am super crazy. third entry of the day. this will be the last and i will go and do my work. i spent a lot of money recently. going broke. ok lemme see wat i have bought these few days. i am so broke now. oh and i was very happy on saturday! coz my tribute to mr peh appeared in THE STRAITS TIMES! it was a surprise lah. cz i anyhow write one. oh and they so bad cut away so many nice parts! if u have the saturday papers, u can go and see! hehe. especially those in 6 ruby! its at the saturday special report there. and i suddenly miss 6Ruby. miss the laughter, miss the recesses, miss our lessons and everything. life in 6 ruby has indeed been a fruitful one! come to think of it, i sort of regretted. i did not really treasure every moment i have in 6ruby. perhaps there would not be any chance for us to be in the same class ever again! i miss DA QIAO TOO! lots of "first times" happened there. it is really a place that has all my memories. no matter happy or sad. this year is gonna end soon. 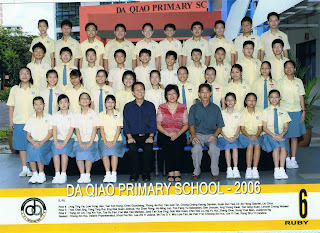 and nxt yr i will be sec 2.
but i will never ever forget DAQIAO and MY DEAR 6 RUBY! thanks 6 Ruby for everything. thanks for giving me wonderful friends lyk xinyun, candice, yoongkwei, melissa, yuhui, weilu, eva, joelance, joey, sufen, valerie and others. thanks for letting me be wat i am today. i want to thank all the teachers in dqps too! i will not be wat i am today if not for ur guidance! i hope that everyone will still keep in contact and that 15 yrs down the road we will still meet each other. it will be nice then to think abt the past. as for now, look back ocassionally and u will realise that u have come a long way. from p6 Rascals to p6 Rubies u noe? and nxt time u all must invite me to ur wedding dinner k? haha. ok today i am finally free to blog! but later still must continue mugging. so i better hurry. JOLENE'S GOAL FOR THE DAY: STUDY SCIENCE FOR AT LEAST 8 HOURS! i wonder if i can be dat disciplined. ok i promised to blog abt friday! so here it goes. it was fun and tiring. i run here and there. never even get to play the fringe activities lah. so sad and wat a waste. i think the fundraising activities and all were super nice. we (1A and 2A) set up a stall in the canteen. erm the name of our stall is "Sugar Sweet" or sth. and guess how much we earned? and i had a hard time counting all the coins. kiran's ice cream were selling like hot cakes! we did not have much celebration for teachers' day. juz sang some songs and watch the video. and i sat with samantha, catherine and xuepiao. hahaha. they are so funny. Anyway, the 50 laps@ Cedar was a success lah. Mr Tay, Mr Lee, Mr Chan and dunno who are "Heroes of the day". school ended late. at 12 plus. i was lyk "WTH? i tot they said is 11.30?" ok so anyway, i went back to daqiao wif xinyun and peisin. joelance say she will join us later cz she got the dunno wat pizza. the 3 of us took a cab to zhong hua to pick justin and our dear candice to amk hub. then the stupid taxi driver say "erm 5 people cannot lah. get down. " then i was pleading and pleading. but it was still a NO. ok lor dun want dun want lah. then we took 135 from zhonghua. and so many people called me. i think they were getting really impatient. waiting for me at amk hub! i am so sorry people! i rushed there as soon as possible already! ok so at amk hub, we bought a cake. tiramisu cake. for the teachers. it was quite ex. $40. haha. so we went back. we took bus 88.
when we alighted, i did the dumb head count and realised that peisin was missing! then everyone was lyk "how how how?" then i said she knows then way lah. then later at daqiao we saw peisin! she took 73 by herself! WTH. make everyone so worried! we went into daqiao at 1.30.
and visited the teachers and cut the cake. the cake was meant for the teachers but i think we ate more! that justin was fooling around. he keep on wanting to put the cream from the cake onto my face! want to make me paiseh. i already super embarrassed already. the moment i walked into the school. ms khoo, mr foo, mrs tan they all talked abt me writing to the straits times abt mr peh. after that, joelance and me roamed abt the school. then i raced with yoongkwei! i won him by a tiny weeny bit in the first one. and he claims that he thrashed me in the middle-d one. haha he run super fast lah. oh and so scary i talked to mrs singh. she call me go see her. it was a really fun day lah. i met a lot of my classmates and friends. nice to see that they are all doing well! melissa, yuhui, eva (she is wearing contacts! ), weilu, yoongkwei, xinyun, candice, sufen (with rebekah), joey, liuchun, guochang, joshua, justin, valerie, toh hong, jiarui, lincoln, CJ etc. and most importantly, i saw HIM! haha he said dat i should grow taller! i am shorter than weiren by one head. and i saw toh wei, ping yen, wei ren, zuo hao, mabel and HIM lor. the faces all different one. lastly, melissa, yuhui, zimo, joelance and me went for a tour around the neighbourhood. it was MELISSA'S BRILLANT IDEA! and then i walked home wif her. we took some photos lah. but i decided not to upload coz i look super ugly and messy. i hope nxt yr would be as fun! MISS U GUYS A LOT! i cannot stand it alr. ok i am sleeping now. shall blog abt the 50 laps @ Cedar and everything tmr!